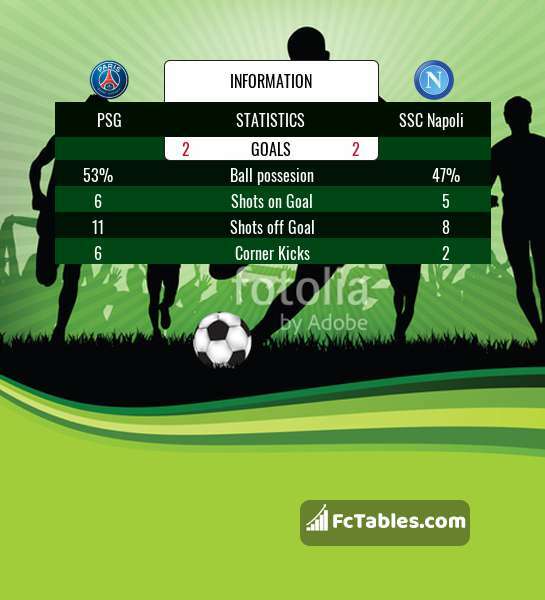 Kick off PSG-SSC Napoli in Champions League on today 19:00. Referee in the match will be Felix Zwayer. Team PSG is located in the middle of the table. (3 place). PSG in 5 last matches (league + cup) have collected3 points. To defend SSC Napoli the most demanding players will be Neymar 3 goals, Kylian Mbappe Lottin 2 goals, Edinson Cavani 1 goals, because this season they scored the most goals for PSG of the entire composition. Most goals developed: , Kylian Mbappe Lottin 1 assists, Edinson Cavani 1 assists. Injuries in the team PSG: Thiago Silva, Lavyin Kurzawa, Colin Dagba, Daniel Alves. The match will not occur Gianluigi Buffon because they are suspended (cards, etc.). Team SSC Napoli is at the top place in the table (1 place). SSC Napoli in 5 last matches (league + cup) have collected4 points. In this season games Champions League the most goals scored players: Lorenzo Insigne 1 goals. They will have to be well guarded by defense PSG. Most assists in the club have: , Jose Maria Callejon 1 assists. Injured players SSC Napoli: Simone Verdi, Faouzi Ghoulam. Direct matches: usually ended with winning of PSG. Balace of both teams games are: 1 won PSG, 0 wins SSC Napoli, 0 draws. In 1 matches the sum of the goals both teams was greater than 2.5 (Over 2.5). On the other hand, 1 matches teams scored more than 1.5 goals (Over 1.5). In 1 matches the both teams have shot at least one goal.